A bull’s immediate value to any breeding program is through the progeny he produces, whether that be through natural or A.I joining, he will ultimately be judged by the progeny he directly sires. The influence he has however is far greater and understanding his role, and the role past sires have, on the calves you produce this year is the key to realising genetic gain. If we take a simple look at the influence of a bull, we see that the bull contributes about half (50%) of the genes to the progeny, with the cow contributing the remainder. This we all know, but what we often forget, is the genetics carried by the cow is made up of about half of the genes of their sire. So, if we then take a step back and look at our selection influence on the calf, what we see is that in a typical self-replacing breeding program, that buys in bulls, this year’s bull has a ~50% influence and the previous sires we selected have ~25% (maternal sire) and ~12.5% (maternal grandsire) influence. Or another way of looking at this is that ~87.5% of the genetics of the calves is influenced by the sires used in the past 3 generations. The influence of maternal sires and grandsires means that when we make selection decisions on a bull, we need to understand the decision in relation to the other decisions we have made. This is important because if we want to make genetic progress these selection decisions need to complement each other and the broader objectives of the breeding program. Understanding then that a bull will have an immediate impact over 1-5 years in direct siring of progeny and then an additional 3-10-year impact on the cow herd and then a further reduced impact on the cows of the future in 20+ years, means when we make the selection we need to get it right and understand it with the future in mind. Part of getting this decision right is about understanding what role the bull plays in our breeding program. Will you retain lots of his heifers? Will you retain none of his heifers? Will we use genomics in the selection of heifers? Will he sire a bull? All these questions aim to understand what sort of reach he will have. Only once we understand the impact the bull has on the breeding program can we understand his value. Whether commercially or seed stock focused the message remains the same, the value a bull has should be considered in the long term. The strong environmental influence on his physical performance often overshadows this but the success of your breeding program will depend on whether the bull improves your cow herd or keeps it average. 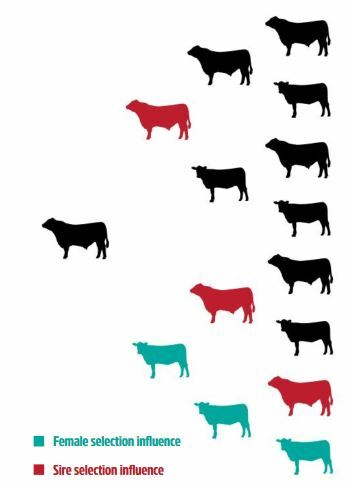 Did you know that if an average heifer (50% percentile) is bred to an average bull (50% percentile) by the time the calf is able to be mated, it will be below average (bottom 50%) in the breed? Genetic gain within the Angus breed has been driven by the great work seedstock producers have done in applying technologies like EBVs and genomics, blending them into programs which assess not only the physical characteristics we see in the animal but the science of breeding values. The importance of understanding then that the heifers we breed today will produce the cows of a better future means that if we want to produce more profitable cattle, we need to breed the cows we want in 10 years’ time, now. Irrespective of the conditions, when exposed to the same conditions, the higher genetic merit animal will perform better than a lower genetic merit animal. If exposed to different environmental conditions (such as feeding programs), the physical performance of poorer genetic merit animals can be above that of higher genetic merit animals. Breeding values take the hard work out assessing the merit of an animal because they take into account a huge amount of data, not only on the animal itself but also how animals in its pedigree have performed and how the genetics its carrying have performed in other animals. This performance is assessed in relation to how the animal performed in relation to other animals within the herd, which enables the influence of environmental conditions to be accounted for. Using breeding values and assessing the change in breeding values towards our breeding objective enables a bull’s value to be appropriately assessed. Producing the highest quality cattle relies not only on great genetics and breeding, but also suitable feeding and environmental conditions to allow the genetics to express themselves to their full potential. Overall what this means is that means is if we are to realise the true value of a bull in our herd, we need to understand his impact is just one part of all the bulls in the pedigree. We need to understand that average doesn’t cut it and that if we want to have more profitable cows in the future, we need to make the right decisions now and understand what the bull has truly delivered to the herd, all of which is made easy with breeding values.